"If they ever release a good computer, we will do it," Luckey said to Shacknews at a Microsoft Xbox press event. "It just boils down to the fact that Apple doesn't prioritize high-end GPUs," he explained. "You can buy a $6,000 Mac Pro with the top of the line AMD FirePro D700, and it still doesn't match our recommended specs. So if they prioritize higher-end GPUs like they used to for a while back in the day, we'd love to support Mac. But right now, there's just not a single machine out there that supports it." The Rift, shipping March 28, already pushes the performance boundaries of mid- to high-level Windows PCs, requiring at least an Intel Core i5-4590 processor, and an Nvidia GTX 970 or AMD R9 290 card for graphics. 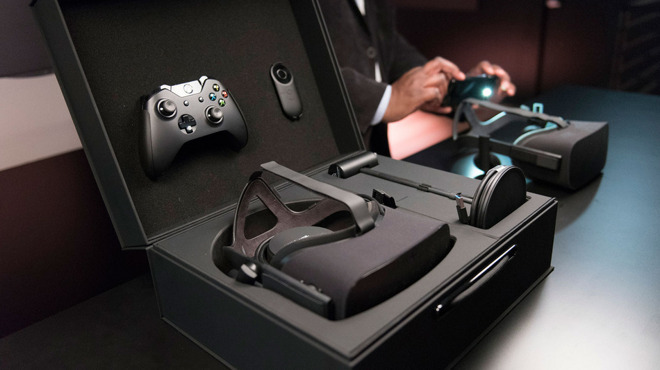 Computer bundles with the headset included start at $1,499. The GTX 970 and R9 290 are full-sized graphics cards, whereas most Macs —even top-end iMacs —use weaker mobile processors in the interests of saving space, cost, and/or power consumption. Oculus officially "paused" work on Mac support last May. In January Luckey made similarly pessimistic comments about the Mac, saying that support is "on the roadmap post-decent Apple hardware release, whenever that is."